Washington DC – District of Columbia – food handler safety training is necessary for employees in the mobile food truck and mobile food vendor service and hospitality industry. The phrases “Mobile Food Truck” and “Mobile Food Vendor” refers to several different types of vehicles that food is sold from. 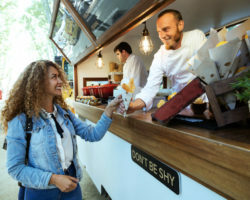 Some examples include: lunch trucks, vending trucks, concession trucks, sandwich trucks, taco trucks, loncheras, catering vehicles, ice cream trucks, and hot dog carts. 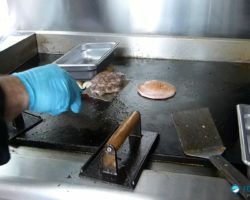 Washington DC food safety training that an employee is required to have in a mobile food truck business (where food is prepared and served) is also called a food handling permit, a license, certificate, card, or credentials. This permit shows the municipality and their inspectors, that the holder has had training in food safety basic practices to prevent food borne illnesses. 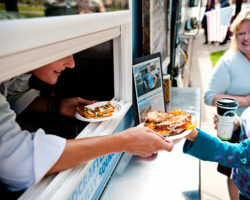 The Washington DC food truck – food handler training course is online, easy to use and takes about 2 hours to complete. 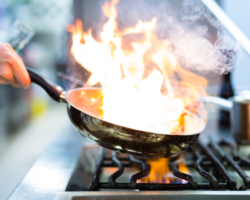 The course is ANSI-accredited, state-approved and will take you step-by-step through everything you need to know, including food safety definitions, safe hygienic practices, safe food temperatures, cross-contamination of food, and food-related illnesses. All food safety content materials and exams are available in both English and Spanish. Start now and obtain your Washington DC mobile food truck – food handler’s training permit! A Class A Vending Business License shall authorize a person to vend food, other than food prohibited from public or private space provided, that the vendor holds any food licenses and certificates required under subtitle A (Food and Food Operations) of Title 25 of the District of Columbia Municipal Regulations (DCMR). District of Columbia Municipal Regulations (DCMR) – Effective October 1, 2013 – Vending- Selling goods and services exclusively from the public space and for the immediate delivery upon purchase. Food trucks, Hot dog carts, sidewalk merchandise vendors, ice cream trucks, etc. We offer online Mobile Food Truck – Food Safety Training in Washington DC for: District of Columbia. Getting your Washington DC Mobile Food Truck – Food Handlers Training Permit couldn’t be easier!